Spam fritters are a memory from our childhood but many people will think of them as unhealthy and full of fat. But, if made with care they can still be part of a family meal without piling on the pounds. They are a cheap meal and your family will love them. Before you reach for the can opener and your tin of spam have you considered other types of fritters? You batter should be light and delicate and form a tasty covering over the contents. The inside of the fritter will be hot and tasty without retaining any of the oil from the cooking process. A quick batter recipe consists of 120 g of self raising flour, a pinch of salt, half a pint of ice cold milk and one egg. Sieve the flour into a mixing bowl and add the egg and salt. Gradually whisk in the milk until you have a thick batter that will coat whatever you wish to fry. There are other types of batter that can be used for fritters. Tempura batter is traditionally used for vegetables and is very tasty. Try sliced peppers, baby sweet corn, broccoli or button mushrooms in the tempura batter for light tasty nibbles at a party with a spicy dip. Tempura batter is very simple to prepare. Beat one medium egg in a bowl and gradually add 200 ml of ice cold water. Next add 100 g of plain flour. This is used to coat vegetables and shell fish and is very light and tasty. Apart from Spam why not try corned beef fritters? By keeping the tins of meat in your fridge you will find that the meat slices better whilst being handled. Almost any vegetable is suitable for coating in batter and frying apart from root vegetables unless they have been cooked first. Experiment to find your family’s favourite fritter ingredients. Large open mushrooms and onion rings are great as accompaniments for main meals. Just peel and slice the onions thinly before coating in batter and frying. Mushrooms just have to be cleaned before coating. Why not try large slices of red or green pepper for a tasty difference? Have you ever thought about fruit fritters? Pineapple rings, straight from the can, drained on kitchen paper, dipped into the batter and fried are delicious with ice cream or even custard. Also apples peeled whole and cored then sliced are exceptionally good. Dust with brown sugar before serving. Bananas sliced lengthways or chopped into two inch chunks are another interesting type of fritter. 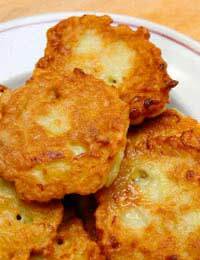 The secret of a good fritter is to cook it in hot oil and quickly. If the oil is not hot enough the batter covering will start to fall away from the meat or vegetables and the whole concoction will be saturated in oil. So dip the vegetables, fruit or meat into the batter, let the excess drip off and drop gently into the bubbling oil. As soon as the fritter is golden brown remove and place onto kitchen paper to remove any excess oils. Serve before the fritters become cold. @Les. Yes you can leave the batter in the fridge. Bring it to room temperature and give it a stir before using it.